Source: Informa Investment Solutions. Past performance is no guarantee of future results. The information provided is for illustrative purposes and is not meant to represent the performance of any particular investment. Assumes reinvestment of all distributions. It is not possible to directly invest in an index. Diversification does not guarantee a profit or protect against loss. A Diversified Portfolio in this example above is composed of 35% of the Barclays US Aggregate Bond Index, 10% of the MSCI EAFE Index, 10% of the Russell 2000 Index, 22.5% of the Russell 1000 Growth Index and 22.5% of the Russell 1000 Value Index. Larry McDonald, head of U.S. macro strategy at Societe Generale, said the all-encompassing lag in performance is one reason why major money managers have done so badly in 2015. 2015 has been particularly troublesome for hedge funds, the average of which was down about 4 percent in 2015 according to Hedge Fund Research. "It's been an absolute meat grinder of a year," McDonald said. Investors like Warren Buffett, David Einhorn, Carlos Slim, they all had bad years." Famed investor Warren Buffett is seeing his worst year since 2008, with Berkshire Hathaway shares down more than 11 percent in 2015. Bill Ackman of Pershing Square Capital sent a letter to investors in December that said 2015 was the fund's worst year since it was founded in 2004. In other years, even bad ones, McDonald noted that investors have tended to find substantial yield in some major assets. "2008 was a terrible year in the stock market, but bonds were up 22 percent. 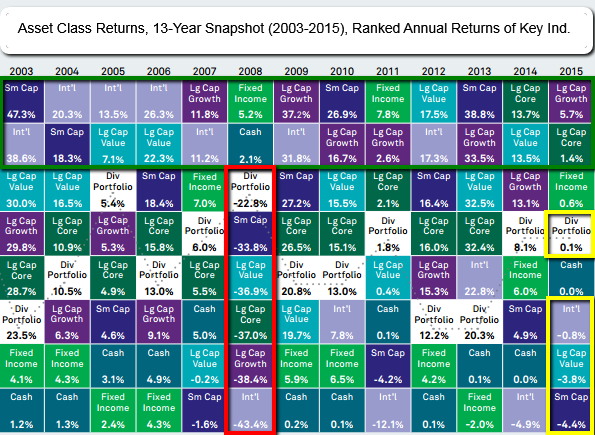 But in the year 2015, not one major asset class had a good year, and that's what's made it so difficult across the board," he said on CNBC's "Power Lunch." Comparatively, this year the U.S. 30-year Treasury note returned negative 2 percent, the 3-month Treasury bill returned 0.11 percent and the CRB commodities index fell more than 23 percent according to Societe Generale.